Rocket Lab has successfully launched its Electron rocket from New Zealand, marking the first success of the small satellite booster. The two-stage Electron roared off its launch pad on the Mahia Peninsula and appeared to have nominal flight. Commentary on the company’s webcast indicate the rocket successfully deployed three CubeSats from Planet and Spire. Planet confirmed deployment of its satellite via Twitter. Spire also confirmed the successful deployment of two Lemur spacecraft. It marked only the second launch of the booster, which failed during its inaugural flight in May 2017. The ground lost telemetry from the rocket, which was blown up by range safety. 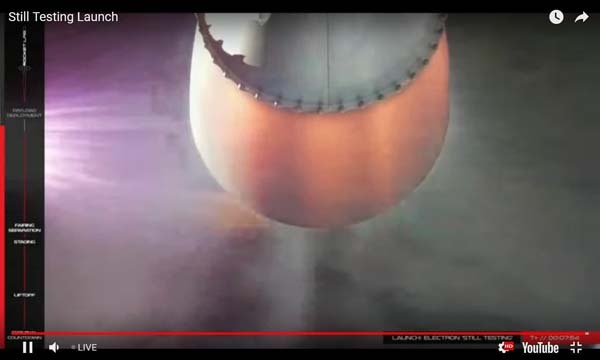 Electron is powered by Rutherford engines and is capable of placing payloads up to 225 kg (496 lb) into a 500-km (310-mile) sun synchronous orbit. Quite an accomplishment! Let’s hope they succeed in the economics; and that MoonExpress can be on its way soon! I think the Moon Express executives have accepted reality and realize they won’t get any prize money from GLXP…However!…There are other ways to fund or make money: crowd fund campaign on the Net? Find an enthusiastic millionaire to be a patron? Plaster advertising decals and slogans on the Lunar orbiter? If Lunar Express successfully parks their craft in Lunar orbit, it would be the FIRST non-government operated and funded Lunar orbiter mission to succeed. That will end cynical talk of vaporware, paper or pixel spacecraft.